How was everyone’s Fourth of July weekend? Mine was spent lounging on the lake with family in Austin. It was amazing to enjoy some downtime and catch up with the fam, especially since it was the last time I’ll likely see any of them until at least Thanksgiving. I’m back in Dallas for the next few days until I head back down to Austin for a wedding this Saturday (which also happens to be my birthday! ), and then I fly out to San Diego on Sunday for a week with my mom, sister and grandmother. After San Diego, I have a solid seven days left until I leave for London. It’s crazy how fast this summer has flown by. I began the packing process for London yesterday, starting with the heaviest of my clothes. Since I’ll be there well into November (and possibly December should I be able to stay a little longer), I need to bring a bunch of heavy sweaters, a couple coats, and lots of other cozy basics. I’m going to try to keep my wintery wardrobe in one piece of luggage and dedicate the other piece to the more transitional items like my lighter Club Monaco trench, day-to-night dresses, and other easy favorites. While I’m mostly packing solids, a few prints have made their way into my suitcase. This printed set is one of them. Even though gingham is a standout print, these pieces will be very versatile as separates, don’t you think? In addition to the gingham, I’m packing a few of my favorite striped pieces, like my Heidi Merrick tank, this T by Alexander Wang linen sweater (on sale! ), and this new Kain tank I just bought. Love this matching set – such a fun print for summer! Love this look! Gingham is such a classic summer go-to :) Hope you had fun on Lake Austin! I love this gingham look on you! I bet these pieces would be great on their own which makes them super versatile! Such a pretty dress and absolutely loving that lip color on you! I’m a big gingham fan, so there is no questions that I loved this look! The sweet ruffles are perfect too! Love this gingham two piece! So cute. I am loving sets lately, so easy and quick but fun! Adorable, Merritt! Hope you had a great holiday weekend. Love the python heels paired with the fun, gingham print! Happy almost Birthday! So, so pretty Merritt! I thought it was a dress at first… love the separates. I just bought a pair of gingham shorts from LOFT of all places… they were on sale this weekend and I can’t wait to get them! Love the gingham duo paired with the snakeskin heels. Such a great combo! Wait, wow, I didn’t realize you are going to be in London for so long. Oh my gosh how fun! One of my favorite cities! I am headed to London in September for a few days, so I hope you will share some London favorites here on the blog?! 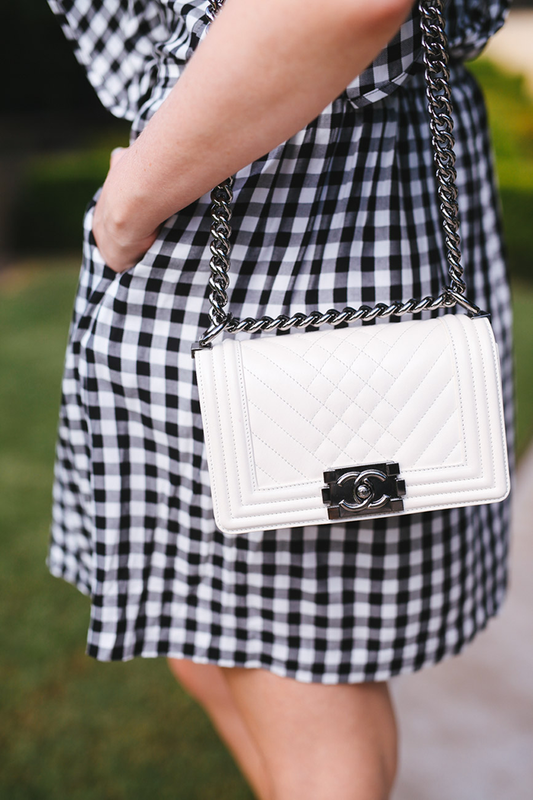 This is such a chic take on gingham! Love, love your style Merritt! lovee this girly preppy look!